Incredibly light, especially compared to the stock lead acid battery. Nice to have an indicator on the top to show the charge state of the battery. Mine needed to be charged before hand unlike some of the previous reviews have experienced, no biggy. Charged and bike starts beautifully now. The test light is a really nice addition and I was really impressed with just how light this battery is. 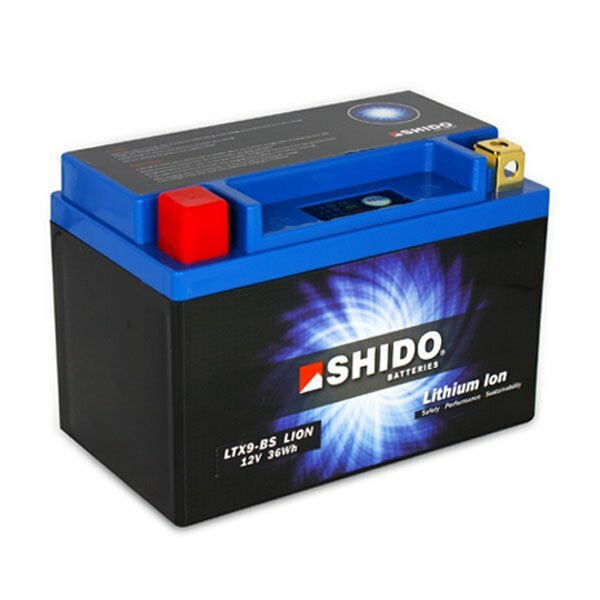 I will be buying another Shido Li-ion battery when I need one next. Great product, fitted straight into my bike( GSX650F). Very light and comes fully charged. Delivered ahead of time and seems to be working fine. Bought the Shido to replace a Yuasa PB battery theatre was killed off by the recent Siberian weather. Never had a lithium battery before and the difference in weight between this and the Yuasa is shocking. The Shido almost feels like a toy but once fitted it's apparent the Shido is anything but. My bike (2006 ZX6R) fired up so fast, even though it had not been started for 2 months. The Shido even comes ready charged and you can check the battery status using the status button on the top of the battery. The only negative is the Shido didn't come with a nut and bolt for each terminal so I had to use the ones from the old battery. This is why I gave the battery 4 stars (along with the fact I cannot comment on the longevity). One of the most cost effective weight savings you can make to your bike. Bargain! Fitted perfectly in my Honda CB400 SF and is about 1/5th of the weight of the old lead battery! Such a small and light battery but so powerful. Comes fully charged as well. Not the most compact battery, but lightweight and sits firmly inside the 2009 Daytona675 subframe. Far lighter than the standard OEM battery and it has a built in LED to indicate battery status. Highly recommended. Sportsbikeshop nailed it again, delivered on time, no dramas. Why shop anywhere else? I bought this battery this March 2017. From start to finish the transaction was first class. Even when I had problems in fitting, the advice again first class, would certainly use this company again and recommend them without reservation. My last battery let me down time and again. At this time, the Shido fills me with confidence and I wish I had bought one from Sportsbikeshop before. Delivery spot on, item I have used before on other bikes. Can't recommend enough. Had not got a clue!!!... Wife and mother of riders!! As always Sportsbikeshop to the rescue...lovely people, never treat me like the fool I am!! This was the one that fits his Kawasaki Z800. The pair of 'them' had apparently been looking at these for a while...just neglected to tell me!! Both men are impressed by the battery..So light... Feels like a child's toy...apparently, "that's going to make hell of a difference!" I have now got to purchase the appropriate lithium charger for the battery...it needs a full charge before first use and does not charge with the other optimiser. (I don't mind having to do this, but this too is more expensive than the norm and it would have been nice to know this beforehand so that we could've used it immediately!)... Even though the indicator shows full charge.... .....The battery has a lovely useful indicator button on it which lights up to low,med,high charge. Very pleased so far.